‘What two things do the French love most? Duck and champagne, of course!’ says restaurateur Pierre Dutaret of Farago fame. Along with his business partner Jean Valfort, Dutaret has teamed up with sommelier Jean-François Monfort and chef Jason Roman - who grew up stirring the cauldron on the family Hacienda in Peru before training with Michelin-star chefs in New York and Paris - to bring back affordable gourmet dining. Everything on the menu, starring juicy magret, is executed to perfection, but food aside, the boys have stumbled upon a real gem; located inside the Passage des Panoramas - one of Paris’s last covered arcades and most enviable spots - the venue is housed in the former chocolaterie from where the king ordered his bonbons in 1818. 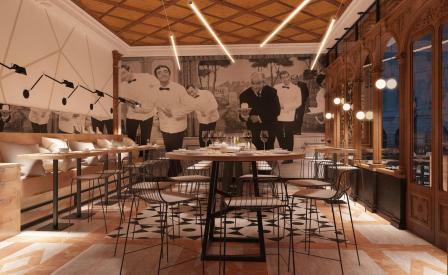 The opulent listed interiors - enhanced by Budapest firm Suto Rive Gauche - feature slick lighting that stretches across the room and timber high tables backed by a blown-up photograph of actor Louis de Funès in Le Grand Restaurant (1966). Downstairs, the cosy cellar has exposed brick arches and a mysterious door leading to unexplored passages.